Within the span of about 30 years the motion picture industry dramatically changed. What was once a filmmaker’s haven in the 1920s where amateurs, professionals, and those in between could make their own films and distribute them how they wished had become a system locking certain people in place to make films while excluding others by the 1950s. The earlier days of filmmaking had welcomed a host of talent ushering in men, women, Asian-Americans, and African-Americans. One’s personal background didn’t matter as much as their ability to raise the money needed to display their stories through the flickering light of a projector. By the 1950s, white men and the stories they chose to tell dominated the avenues of filmmaking with such authority that it virtually barricaded unfamiliar voices from outside of the studio system. Independent filmmakers still thrived inside and outside of the system though the outsider’s numbers remained diminutive. Despite the power that Hollywood held during the late 1940s into the 1950s the struggle for relevancy and profit rose with the arrival of television. Arriving in the 1940s and exploding in the 1950s television quickly became another facet for exploration of Black characters yet little, if any, creative control was given to women or people of color. Black women found navigating through cinema and television to be a slippery slope with many hills to climb and dull support to hold on to. Many of the working Black females in Hollywood found bit parts in movies sticking to roles that had been around for decades. A handful received more promising opportunities as all-Black cast films continued throughout the 1950s and a small amount of meatier roles opened up to a select few. With television taking off only a miniscule group of Black women stood front and center as drivers for their own vehicles, though their efforts would be short lived. 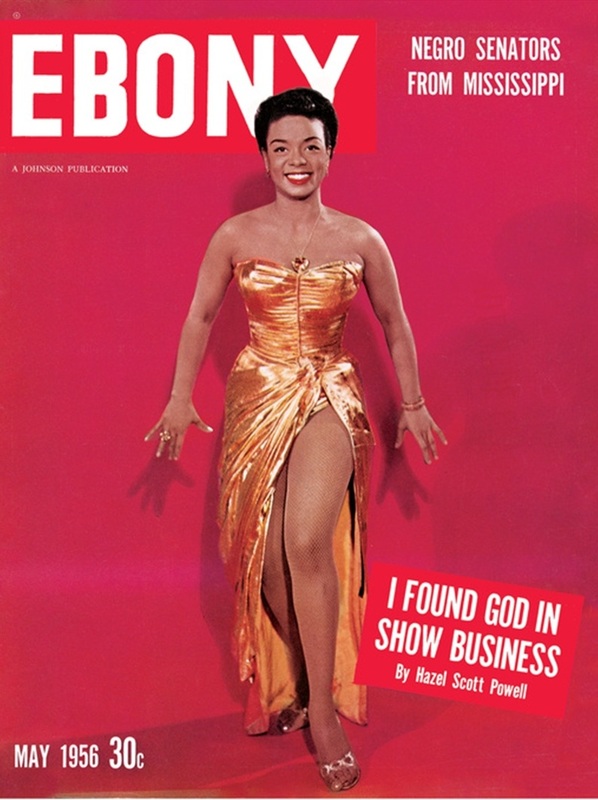 At the start of the decade acclaimed jazz pianist and singer Hazel Scott made waves by becoming the first Black woman to star in her own variety show on a major network station. 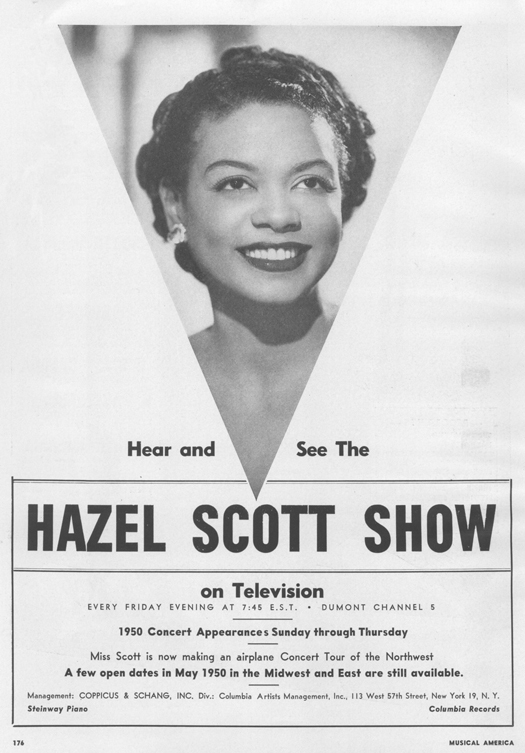 The Trinidadian-born Scott’s talent and vivacious personality earned her a spot on the Dumont Network starring in the “The Hazel Scott Show”. Scott’s program included the performer singing show tunes and other songs along with comedy bits and routines in a 15-minute time slot that aired Mondays, Wednesdays, and Fridays. Scott’s show received average ratings from the fading Hooper rating system and great reviews amongst critics. That failed to help the show thrive when a mere two months after its premiere Scott found herself on the Red Channels list. Her outspoken nature and brash discussions on civil rights had made her a target in age of McCarthyism. Though she voluntarily appeared before the HUAC to defend her performances and appearances at rallies and fundraisers for various organizations, the damage was done and sponsors pulled from her show rendering it cancelled. Scott’s apparent controversial nature also affected her time in Hollywood. Like many women with conviction who stand up for their values, Scott had a reputation of being difficult, one that she even spoke of in a profile of herself in “Ebony” magazine. “For much of my life, a great many people considered me conceited, stuck up, standoffish or what have you. This was because of my shyness. Some of my close friends insist that I am impossible. They say that I will not be serious. They are quite wrong. They just don’t understand. When I want to be serious, I am very serious. Most of the time this whole pose of not caring is just protective coloration.” (Scott, 144). She clashed with Columbia Pictures mogul Harry Cohn while filming Rhapsody in Blue in 1945. Scott became outraged by the stereotypes and lack of visibility for African-Americans within the film. Rhapsody in Blue is a biopic of the life of composer George Gershwin, an actual friend of Scott. Although Scott was hired to play the role of a French pianist that inspired Gershwin, her part got minimized as studios wanted to keep the film safe. In doing so they gradually cut scenes from the film featuring other Black characters while also expelling the role of Armenian born Broadway director Rouben Mamoulian from Gershwin’s life. Producers also kept the film’s leftist original screenplay writer, Clifford Odets, uncredited. Scott’s dissatisfaction with the producer’s choices made her “haughty and high-minded”, but her anger at the film’s lack of diversity and unwillingness to showcase talent due to preconceived notions of race is justified and powerful. Scott declared that she never made another Hollywood film after Rhapsody in Blue (Regester 225-227). Actresses Louise Beavers and Hattie McDaniel still found steady gigs in Hollywood films during the 1950s and were among the few actors of color who transitioned into television. McDaniel was a notable star and paid handsomely for her part in the radio comedy series “Beulah” three years prior to the show moving into television. The sitcom followed the wise-cracking house maid of a white family. Once again, McDaniel was forced to play the servant to white families. McDaniel took the lead role of the television series in 1951, but fell ill to breast cancer and couldn’t finish shooting leading Ethel Waters to take her place and film the first season. Waters quit the show the same year resulting in Beavers taking on the role of Beulah. Each of these actresses possessed immeasurable talents and had become legends in Hollywood, but they were unfortunately subjected to playing a maid for the masses to watch and laugh at. Former Gone with the Wind actress Butterfly McQueen also guest starred in the show as Beulah’s friend, though much like McDaniel, she played virtually the same role as before in Gone with the Wind and all the other roles that followed it. “I didn’t mind playing a maid the first time, because I thought that was how you got into the business. But after I did the same thing over and over, I resented it. I didn’t mind being funny, but I didn’t like being stupid” McQueen said of her role choices. “Beulah” got met with great criticism from members of the NAACP and Black viewers who felt that McDaniel’s role was the stereotypical “mammy” that had become synonymous with large, sexless black women. Meanwhile, Dorothy Dandridge emerged in Hollywood becoming an overnight sensation after her performance in the all-Black cast film Carmen Jones alongside fellow Black actresses Pearl Bailey and Diahann Caroll. Carmen Jones became a box-office smash sending Dandridge into super-stardom. She received notoriety as the first African-American nominated for Best Actress rivaling Grace Kelley, Audrey Hepburn, Judy Garland and Jane Wyman. Dandridge also received a BAFTA nomination for Best Foreign Actress. She went on to sign a deal with 20th Century Fox studios, but quickly faded from the limelight towards the end of the decade. Dandridge is often one of the few Black female figures thought of when 1950s Hollywood comes to mind, but to uphold Dandridge as if she was the first of her kind and a premiere talent of the era is a great disservice to the talents that emerged from the period. Eartha Kitt arose in the 1950s giving a stellar performances most notably in the incredible, yet underrated Anna Lucasta. Kitt’s contemporaries also included Ruby Dee and Pearl Bailey who were each featured in a string of films throughout the 1950s, along with actresses Juanita Moore, Diahann Carroll, and Beah Richards. The iconic films harboring the talent of these women were Carmen Jones, Take a Giant Step, Porgy and Bess, and St. Louis Blues. Overseas in London, writer Sylvia Winters began to cement her name in history after graduating from the University of Spain in the early 1950s. Though born in Cuba, Winters was born of Jamaican parents. She moved to London later in her life where she was given the opportunities to create and adapt radio drama for BBC’s Caribbean Voices and Third Programme. Both of these radio shows focused on highlighting written works from West Indian writers along with discussing racism in parts of South African respectively during the 1940s and 1950s. Winters also had a hand in creating the radio drama “The University of Hunger” with her then husband Jan Carew. Together the duo impressively completed the stage play “Under the Sun” which got bought by the Royal Court Theater in London. Winters is one of the few women of color creating their own content during the 1950s and her career only continued to reach new heights throughout the 1960s and 70s as she moved away from dramas into critical discussions and essays. Within Hollywood, England born actress Ida Lupino maintained the status of the only female directing films during the 1950s (Stanley 45). The actress fell into directing by chance when on suspension for turning down a role. Lupino was a rarity in Hollywood as no other women could yet reach the glass ceiling she found her own self bumping against. Women of color in America found it impossible to even grab the heels of Lupino to direct, write, or produce their own pictures. More creative control was slowly becoming allotted to women of color, but it would still be another few decades before the control was fully theirs. Scott, Hazel. “Ebony Magazine.” September 1960 Volume XV No. 11. A Johnson Publication. Stanley, Richard T. The Eisenhower Years: A Social History of the 1950’s. Bloomington, IN: iUniverse 2012.